In 1990 the Club Committee asked Mr Andrew Hannay and Mr James Blair to write a short history of the Club from its inception in 1905. Andrew’s membership began as a junior in the 1920s and he was President of the Club from 1979 to 1982. Jimmy joined the Club in the early 1930s and was Club Captain in 1957. Before dealing with the post-1945 years I felt the club would be interested in some earlier general information which I had dug up previously with the help of the local library and early editions of the Free Preess. What stimulated this interest was the fact that although Stranraer as a town had a considerably greater population than the other towns and villages in the Shire, why was it there was no course in Stranraer until 1906? Golf was being played in 1893 in Ardwell. This seems a suitable point to refer to the remarkable good fortune which the Club enjoyed in obtaining the services of Mr James Braid as architect of the course. Whether this was through the good offices of Messrs Stutt who were to carry out the construction work, or some member of the golf club committee, is not clear. In any case, James Braid was born in Elie, in 1870, and with Harry Vardon and J. H. Taylor, dominated British professional golf for 20 years before the first world war. They were rightly deemed the triumvirate. He was the first person to win the Open Championship five times and the Matchplay title four times. It was said ‘nobody could be as wise as James Braid looked’. His was a major contribution to golf architecture, involved with Gleneagles, Rosemount, Carnoustie and Dalmahoy among others. He was called from retirement to plan Creachmore, which was to be his last commission and Stranraer members can be justly proud to have one of Scotland’s outstanding courses. James Braid wrote a book called “Advanced Golf” which proved so popular that three editions were published in quick succession. First in April 1908, second in May 1908 and third in June 1908. In that book there is a chapter entitled “The Planning of Courses”. It would be helpful to the committee that a copy of this book should be obtained and kept with the records of the Club. Green conveners of the future would benefit greatly from a study of this chapter which would enable them to retain the Braid characteristics of their course. On the occasion of his 80th birthday, a telegram from the Secretary, Stranraer Golf Club, was sent to Mr Braid which read “Many Happy Returns of the Day and heartiest Congratulations. The new course is taking good shape”. Suffice it to say that over the 39 years existence of the course, the record was set by Mr Charles Findlay, a local dental surgeon, in June 1969, with a score of 66. This card can be seen in the clubhouse. When one considers the many Pro-Am tournaments which, over the years, attracted Scots professional golfers as well as distinguished amateurs such as Mr Charlie Green, it speaks volumes for Mr Braid’s last course, that this record has not yet been beaten (1994). It was sad that neither he nor Mr James Stutt lived to see the course completed. 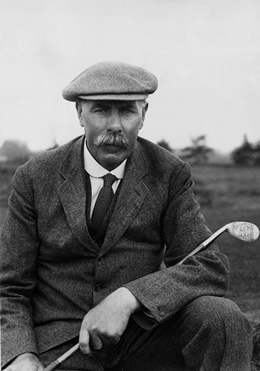 James Braid died in London on 27th November, 1950. At a committee meeting a fortnight or so later the president, Mr James McHarrie, referred to this and described Mr Braid ‘as one of the most famous of Scottish golfers, a man of character and engaging personality. They all recognised the excellent lay-out of the available ground. It would be a fitting memorial to the memory of a great Scotsman and architect’. On the 19th February, 1951, tribute was paid to Mr James Stutt who had died and who had given valued guidance to the Club.